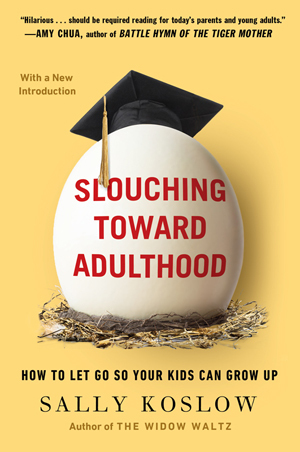 Do you know people in their 20’s and 30’s who are “slouching toward adulthood?” Why do you think they’re wandering? What do you especially like about the generation of Americans currently in their 20’s and 30’s? What do you wish you could change? Is this a good or bad time to be young? Who’s had it easier as adultescents: Boomers or their children? What’s similar/different about today’s adultescents and their parents at the same age? Do you think it’s a good idea for young people to experiment in their 20’s? Did you? What do you think that parents owe adult children? How involved are you in your child’s life and what form does this involvement take? How close are you and your child? How does this compare to the way you were raised? What do you wish you’d done differently in raising your children? What mistakes do you see other parents make? Do you have personal experience with an adultescent returning home to live after college and if so, what are/were the circumstances? If you are a Boomer parent with a child in the 20’s or 30’s living at home, does that child contribute toward household expenses? What boundaries, if any, have you established? If you are a parent of someone who has graduated from college in the last ten years, are you more or less involved financially in your child’s life than your parents were in your life? Have you lent or given money? Paid for graduate school or helped to repay loans? Contributed toward the purchase of a car? A home or apartment? Vacations? Other expenses? Helped your child move? Do you think that the parents of Boomers were less concerned about their children’s self-esteem than they should have been? Too concerned? What should they have done differently? Do you feel Boomer parents are overly concerned about their children’s self-esteem? If so, how is this concern displayed? When you look at the way young parents behave today with small children, are you impressed? Worried? Shocked? Are adultescents more or less responsible about money than their parents? How are attitudes toward work and money different between the generations? How are attitudes toward relationships and marriage different between the generations? Ditto, parenthood? If you are an adultescent, what’s one thing you wish your parents had done differently? What mistake do you think your parents made? Name one thing you wish you had done differently. Are our parents too intrusive? If you are an adultescent, do you think you have more or less direction than most of your peers? When you look at the generation of adultescents now in their 20’s and 30’s, what are your major concerns regarding their lives? Boomers, what worries you most about your child’s future? What advice would you give? Adultescents, what do you worry about most in your own future? For what are you most grateful?